This is my Mum's Bread Pudding, from the Wartime Years and those which followed. Made from whatever was in the larder at the time, here's the basic recipe. It brings back SO many memories! Put bread in a basin and add a little water. Leave for 10 minutes. Squeeze water opuit of bread till it is fairly dry. Add all other ingredients except the spices, adding milk to make a sticky consistency. Add spice to taste. Place mixture in a greased pan and cook at 160 degrees C for an hour till the edges are brown and the centre is moist. Sprinkle sugar on top 10 minutes from the end of the cooking time. Cool a little before serving. My Mum added "extras" - like a spoonful of jam or marmalade, perhaps. A pudding to experiment with - what could be better?! Pre-heat the oven to 200 degrees C (400F or gas mark 6) and have ready a lightly greased baking sheet. Place the flour, cinnamon, butter and Weetabix in a food processor or bowl and blend the ingredients together until they resemble breadcrumbs. Add the sugar. Peel the bananas and mash with the egg. Blend the banana mixture into the Weetabix mixture and mix well. Stir in the sultanas and chopped cherries. Spoon the mixture, making "heaps" on the baking sheet, allowing room for the cakes to spread. Bake for 15 - 20 minutes until the cakes have risen and are golden brown. Whilst still hot, brush the cakes with clear honey and sprinkle a little demerara sugar over each. I have to thank Connor for this recipe for sultana scones. We have applied our very own Cook 'n' Consumer Test and they have more than earned their place on the Cook Book page. Sieve the flour into a large bowl, add the margarine and mix with the fingers until of breadcrumb consistency. (In our family, we call this "doing fingertips.") Add the sugar and the sultanas. Add half the milk and stir it in. Keep adding small amounts of milk until the mixture sticks together but isn't sloppy (add more flour if it does get sloppy.) Roll the mixture into a big ball, flour a surface and put the dough ball on top. Squish the ball until it makes a circular shape about the height of your thumb-nail. Cut out small circles (we used a small cup as that's what Connor suggested). Brush the scones with milk then cook in a pre-heated oven at about 160 degrees till golden brown. Spread with butter, jam, or whatever you fancy. Eat and enjoy. Thanks, Connor - great recipe! Add the dry ingredients to the mug and mix well. Add the egg and mix thoroughly. Pour in the milk and oil and mix well. Add the chocolate chips (if you are using them) and vanilla extract, and mix again. Put your mug in the microwave and cook for 3 minutes at 1000 watts. 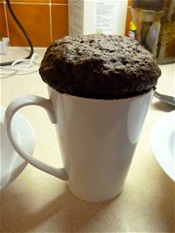 The cake will rise over the top of the mug (see photo) but don't be alarmed! Allow to cool a little, then tip out onto a plate. EAT! This can easily serve two if you want to feel slightly more virtuous / less greedy. And why is this the most dangerous cake recipe in the world? Because we are all now only 5 minutes away from chocolate cake at any time of the day or night! With thanks to my oldest friend, Pat, for sending me this recipe. 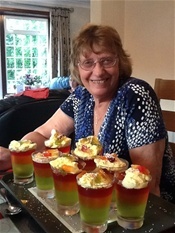 I am famous with my grandchildren for my "Ready, Jelly, Gos" - aka traffic light jellies. They really are the easiest of party food, if a little time-consuming, and they look amazing. All you need are red, orange and green jellies plus some plastic glasses. Three jellies make 6 - 8 Ready, Jelly, Gos at a cost of less than a pound. Just multiply for bigger parties. Main thing to remember is that you start with the green jelly (the first time I made this, I started with the red - wrong!) Each layer takes a short while to set in the fridge but if you time it right, you can start first thing in the morning and have them all ready for tea. Ready, Jelly, Gos can be adapted for special occasions. Last Christmas, I added ice-cream, sprinkles and shooting stars to turn them into "Ready, Jelly, Ho, Ho, Hos" and at my recent birthday at the beginning of June,we celebrated the Queen's Diamond Jubilee (and my birthday) with Ready, Jelly, Jubilee, Go, Go, Gos (pictured). These added ice-cream plus jelly champagne bottles. Anything goes, with Ready, Jelly Gos!